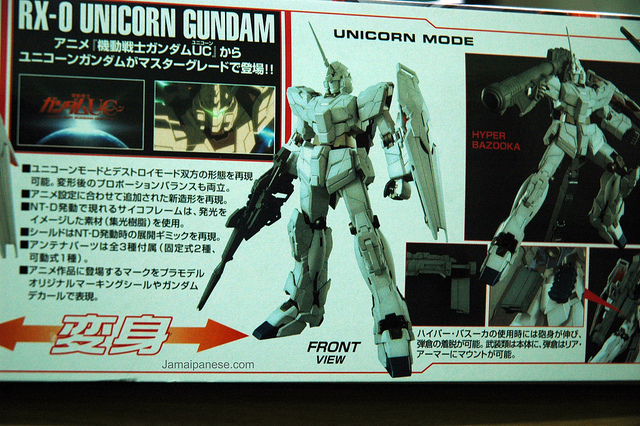 HomeFiguresI’ve acquired a Unicorn Gundam Gunpla Kit! I haven’t built a new Gundam model in quite a while, the last one I put together was the GN Archer just about a year ago. With my plan to visit Japan and all the saving necessary I have had to stop purchasing model kits and divert all that money to the Operation Visit Japan fund which is progressing nicely I must say. 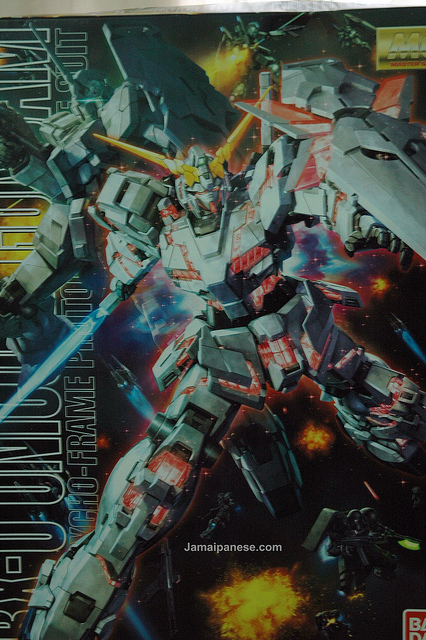 Fortunately my friends at Hobby Search Japan was kind enough to send me a Unicorn Gundam model and like a crack-head fresh from failed rehab I have dived into my addiction again. 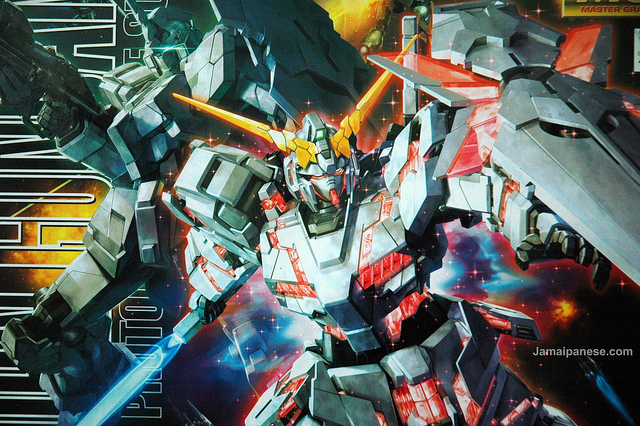 I first saw the Unicorn Gundam in the anime of the same name, the first episode of which you can read about here. 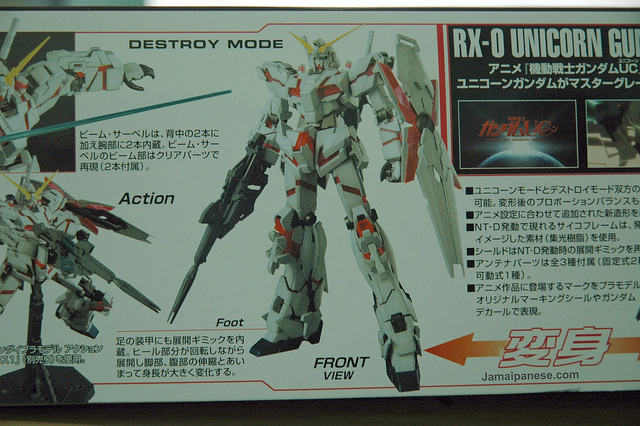 This is a 1/100 scale Unicorn Gundam kit, most of my build Gundam models are 1/144 scale with my only other 1/100 being my Astrea Type F. At the moment while writing this post I haven’t started building the Unicorn Gundam yet, I was too busy making a video about it which is embedded below but from looking into the box I can already tell that this will be more complicated and even more fun to build that any other Gundam figure I own. A few more pictures of the box and a video below, it will take a while but look out for more on the RX-O Unicorn Gundam Psycho-Frame Prototype Mobile Suit once have finished building it, especially if you are a Gundam fan, there might just be a surprise in store for one lucky Jamaipanese.com reader ^_^. You’re soooo lucky. I have the older version of this kit and believe me it is AMAZING!! have fun building it.. I’ll be keeping an eye out on your progress! look out for photos and a video when I am done! can I see pics of yours?